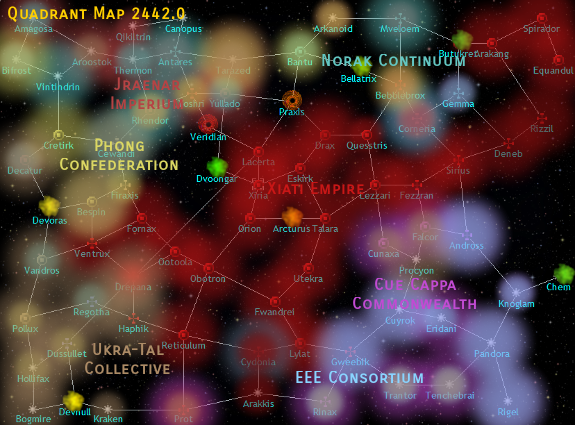 With the Xiati Empire now bisecting the entire quadrant, many of their enemies have colonies that have become isolated, cut off from the bulk of their empires and more importantly, their fleets. The Xiati isolation stratgey has provded very successul. With near impunity, Xiati fleets block off entire systems while invidual colonies are bombarded to a defenseless state and conquered. Concurrent takeover efforts in Drepana, Corneria, Gemma and Prot are underway and once completed, will not require any additional defenses to be established once those systems are conquered. 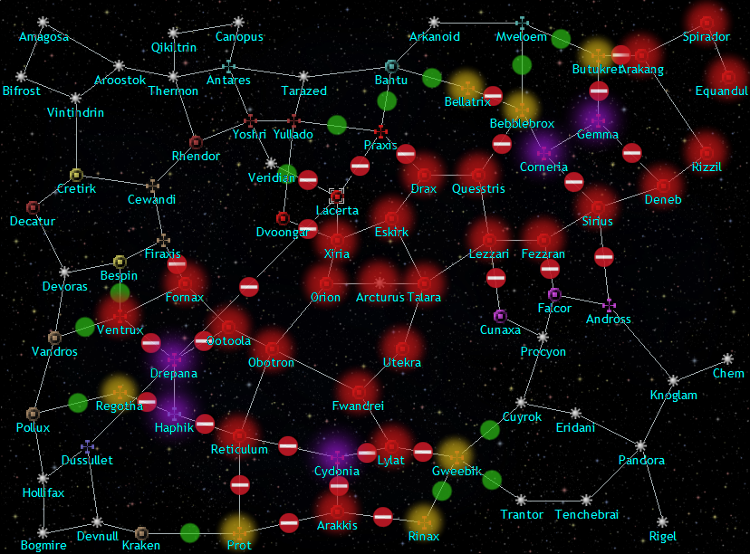 After a bit of a lull during 2440, Xiati forces in the northern systems had been replenished and were ready to strike new targets in the Corneria and Gemma systems. 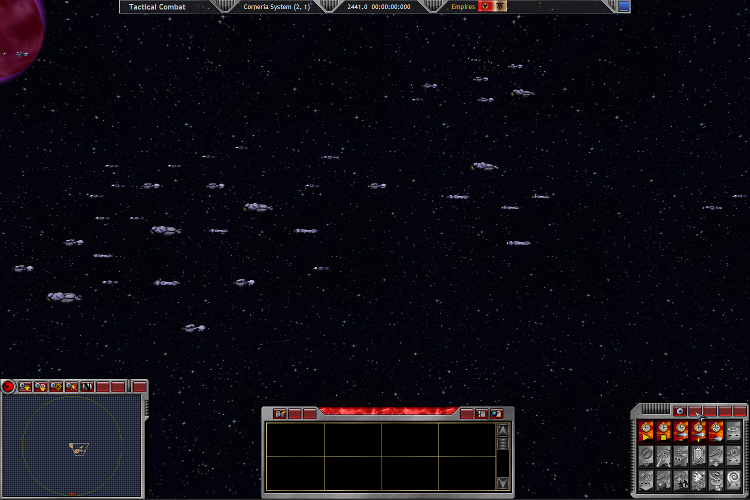 In orbit of Corneria I, the last significant enemy fleet presence remained. Over 40 Ukra-Tal ships and other forces lurked (16xLSat,93xLFtr,14xDEs,12xCRs,5xDNs,2xLCXs,4xMFs,4xLFs,1xSB) and would have to be dealt with first. 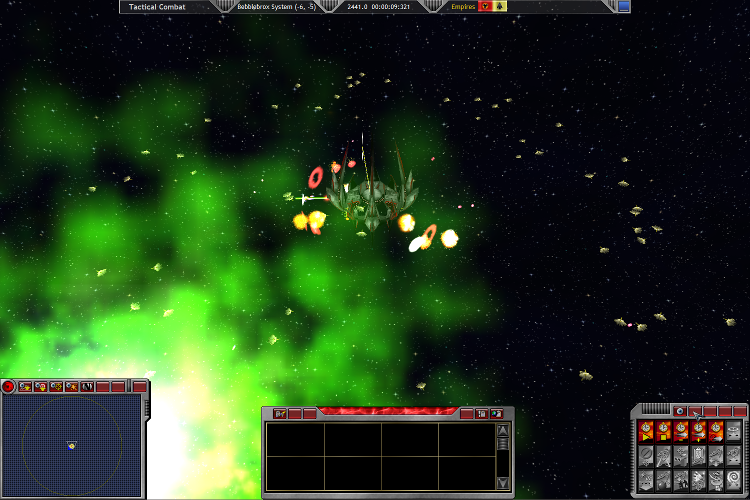 The Xiati Corneria Attack Fleet (2xDEs,4xLCs,6xCRs,2xBBs,2xDNs,6xLFs) carefully engaged the Ukra-Tal at Corneria I, drawing them away from the planet and destroying them with losses of 1xLC, 2xCRs and 1xBB. The planet itself was not engaged. Once the Ukra-Tal fleet was destroyed, Xiati invasion forces landed on Corneria VII (EEE) in 2441.3 and Gemma III (Ukra-Tal) in 2441.4, taking both planets. With the systems of Bebblebrox and Butukret blockaded to the north, enemy reinforcements are cut off. Xiati commanders in the two systems have requested additional time to build new troops before they can begin attacking again. In the west, the Ukra-Tal have started mounting regular attacks on the Fornax-Firaxis WP, which had remained relatively inactive for the last few years. 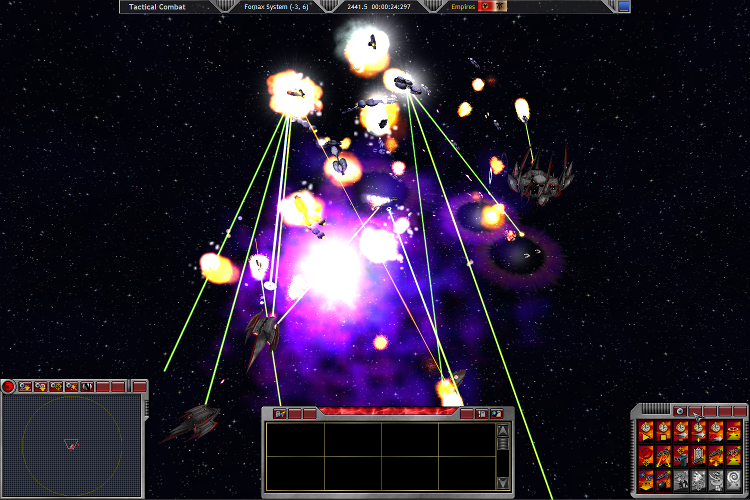 Consecutive attacks in 2438.3 and 2438.5 by large Ukra-Tal fleets did damage but perhaps if they had attacked in a single strike they could have overwhelmed the Xiati defenses. As essentially the Xiati's only rival at the quadrant level, the Ukra-Tal losses at Corneria I, while signficant locally, did not make much of a dent in the Ukra-Tal's overall strength. Building ships at a rate close to twice as fast as the Xiati, the Ukra-Tal instead went on the offensive against a number of Xiati WP blockades. Twice they struck their favourite target, the Fornax-Firaxis WP, in 2441.3 and 2441.5. The Ukra-Tal also struck at the Regotha-Haphik WP and more suprisingly, attempted to breech for the first time in over 10 years, the Lacerta-Dussullet WP. 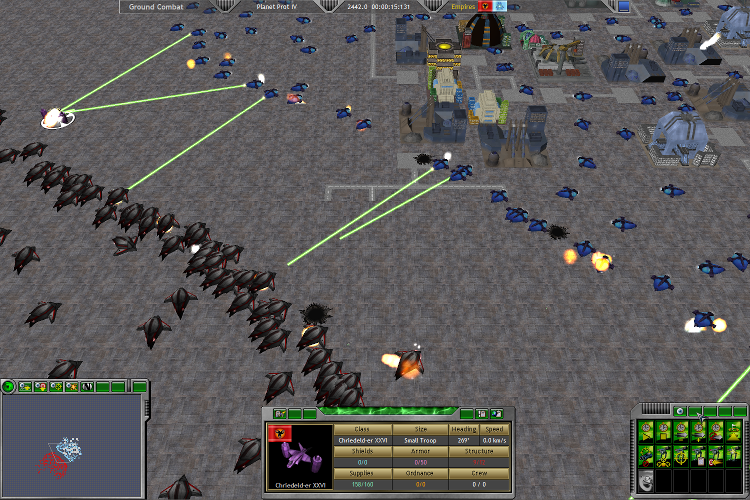 Fortunately in the later attack, a number of mines remained unswept and softened the Ukra-Tal fleet for the warp point's stationary defenses as no mobile Xiati assets were nearby. Despite the frequent losses, the Ukra-Tal are undettered in their efforts. It looks like targeting their key resource producing colonies will be the only way to truly impact their empire. After overwhelming success during 2440 in Drepana, most of the Xiati forces in the south and west spent the year replenishing supplies and troops. Remote mining operations in Arrakis came online and provided a significant boost to the treasury. Perhaps the only dissappointment expressed by Emperor Tax'renath was that some of most plentiful mineral asteroids had already been depleted somewhat by the system's previous owners. With troops freshly supplied from Reticulum and Cydonia, the Prot Fleet launched their first attack in the Prot system against the EEE colony on Prot IV. The huge gas giant colony with 176% mineral value was a clear target. 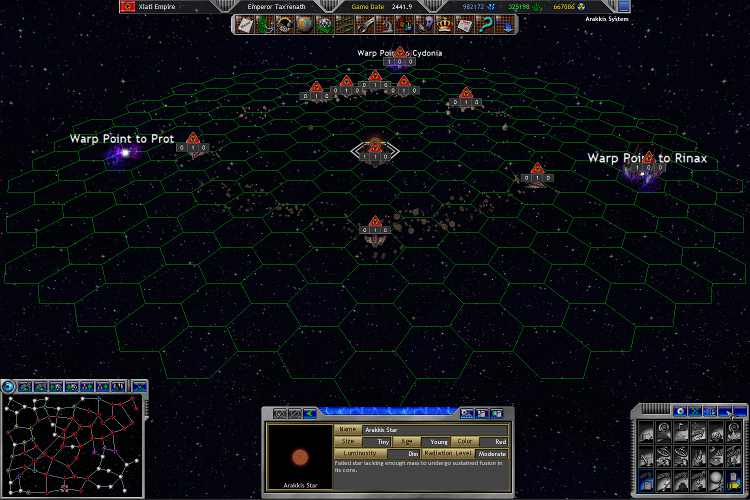 Almost 300 Xiati troops were dropped to ensure the planet would be captured with no setbacks. Over 6180B EEE and Phong citizens were conquered. Mineral estimates once the planet is repaired and the planet's population brought under full control are over 150,000kT per month.